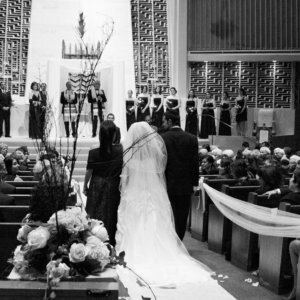 Facility Rental & Weddings – Temple De Hirsch Sinai. Temple De Hirsch Sinai offers prime rental space at both of our beautiful campuses: On Capitol Hill in the city of Seattle and in the Eastgate area of Bellevue. Accommodating small to large-scale events, Temple provides varied spaces that accommodate a wide variety of parties, programs, gatherings and events. Consider hosting your next simcha (joyous event) at Temple. Seating options can accomodate between 15 and 950 guests. Temple’s two parking lots, historical building, and central Capitol Hill location make us the perfect venue for your wedding, b’nai mitzvah celebration, or baby naming/brit milah. For date and space availability, please contact Joy Rousso, Director of Operations, directly at (206) 323-8486.